If you are a Hollywood movies lover then how can you forget the most favorite and fabulous hero the 007, yes! It’s James Bond the 007. James Bond is a fictional character created by British novelist Lan Fleming in 1953. He wrote twelve Bond novels and two short stories. James Bond appeared in different movies with different characters. However, people loved Bond in each character. William jacket presents you with the attire of James Bond 007. Show your love with James Bond by having the attire of James Bond that we are going to present. James Bond Specter Morocco Jacket is inspired by James Bond Specter Morocco. The leading character of James Bond has been depicted by Daniel Craig. This jacket is made up of suede leather. A suede leather jacket gives a few comparison and texture to your outfit and looks exceptional in both black and brown. The fashion of the jacket is truly down to you but holds it simple underneath to make the maximum of the fabric. This jacket has viscose lining inside that will give you comfort in a cold environment. It has stood up style collar with front zip closure. James Bond Specter Morocco Jacket has full-length sleeves with open hem cuffs.James Bond Spectre Austria Jacket is inspired with the Hollywood smash hit movie series James Bond, from its part Spectre. This character is depicted by Daniel Craig. This jacket is different from the rest of the jackets as it is made up of navy blue nylon with viscose lining inside. It has an erect collar with zip closure. Sleeves of the James Bond Spectre Austria Jacket are made up of black wool that makes it more unique and beautiful. This jacket has a color combination of black and blue which you can pair with any dress. Daniel Craig James Bond Spectre Lake Blue Jacket is again inspired by James Bond Specter Morocco. The leading character of James Bond has been depicted by Daniel Craig. 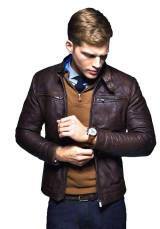 This jacket has a shirt style collar and dual strap characteristic. It could be fastened through button and zip that depends on your whole dress. This jacket is made up of wool blend with viscose lining inside the jacket. It has zipped cuffs with flap pockets inside and outside of the jacket. Overall this Daniel Craig James Bond Spectre Lake Blue Jacket has blue colors, which suitable for its super decent look for every occasion.